This in itself is nothing new: Nor is the notion that you should join Groups related to your industry. The big mistake too many people make, however, is in joining Groups whose focus is too narrow. Let me explain: Say you are a copywriter. You join six Groups whose sole focus is “copywriting”. And you stop right there. Of these three topics, Project Management is going to be important to your ideal client. He wants to hire someone who knows how to get things done on time – who is passionately concerned with Project Management (and saving him money). So if you have to make a choice, find that group on Project Management and add yourself to its membership… where project managers can find you and either recommend you to their employers; or contract your services directly, if they are business owners. 2. 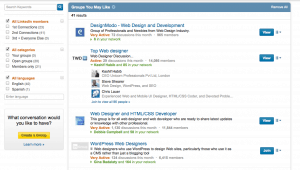 Create Your Own LinkedIn Group. Once you’ve grown comfortable on LinkedIn, made connections and feel you really have a handle on what your potential clients or subscribers are looking for within its environment, it’s time to create your own LinkedIn Group – targeted directly to their needs. Give your group a clear, strong name. Include your best keyword – the one that seems to get the most LinkedIn responses for you. Keep it short and avoid names that are obscure. For example, if your group is all about self-growth and creating best choices in one’s life journey, avoid flowery names like “Architects Unchained” – because if you go with a name like that, I guarantee droves of really annoyed architects, renovators, builders and engineers will be clicking away in disgust… while the people on journeys of self-growth will remain happily unaware of your existence. Make sure it’s a name that will translate well into an URL. And do test your Group name out first – even if that just involves a Facebook poll giving people three to five choices. Even people with no intention of joining your Group can often be quick to point out potentially embarrassing or confusing aspects you’ve overlooked. Create a logo for your Group. LinkedIn specifies that your Group logo should be no more than 100kb, and suggests dimension of 100 X 50 pixels (“large”) or 60 X 30 pixels (“small”.) Keep your design striking and simple. Keep elements in it to a minimum. Your logo will help brand your Group within LinkedIn. 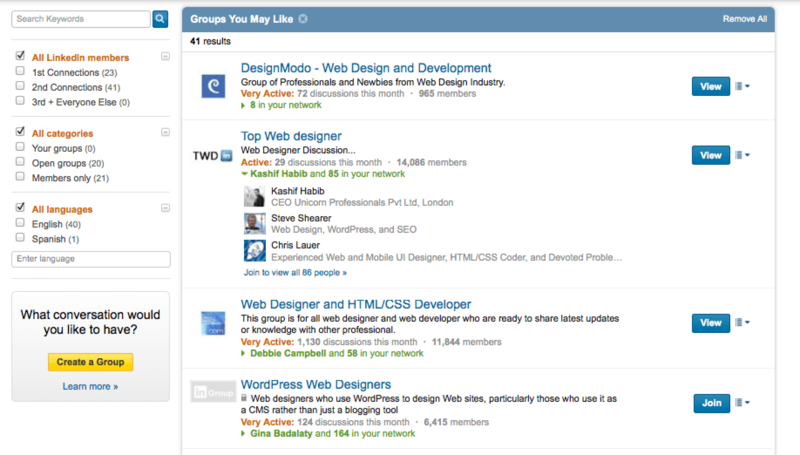 Create the Group around your Keyword – not your Company. This one should be obvious, but judging by the company-based groups that try to reach niche members, it’s not. If people see a Group with your business name – and especially logo – they will assume that it’s an internal group for your employees and/or shareholders. (or else create a section on your existing website). That way, you can post updates, resources – and helpful articles. Having its own website or web page will strengthen your Group’s identity as an entity. And building a community is what it’s all about. Promote your Group. Blog about it. Talk about examples from it. Invite people to join it. But always remember content on LinkedIn is supposed to be strictly confidential, so never share anything that Group Members could object too, and don’t identify people by name unless they are okay with that. Reward your Group. Create special resources for your members that they can pick up from your website: Tip sheets, survey results, templates, “how to” lessons… If they need it – provide it. This has (for the moment) replaced LinkedIn Apps as a “limited rollout” feature. Since this is currently in flux, your best bet is to click straight through to the new Help section and simply click on what you’d like to learn about in the right-hand, vertical menu. Again, this strategy depends on your particular circumstance. In order to create a Company page, you have to have a dedicated email address on your Company’s domain: A Gmail address just isn’t going to cut it. 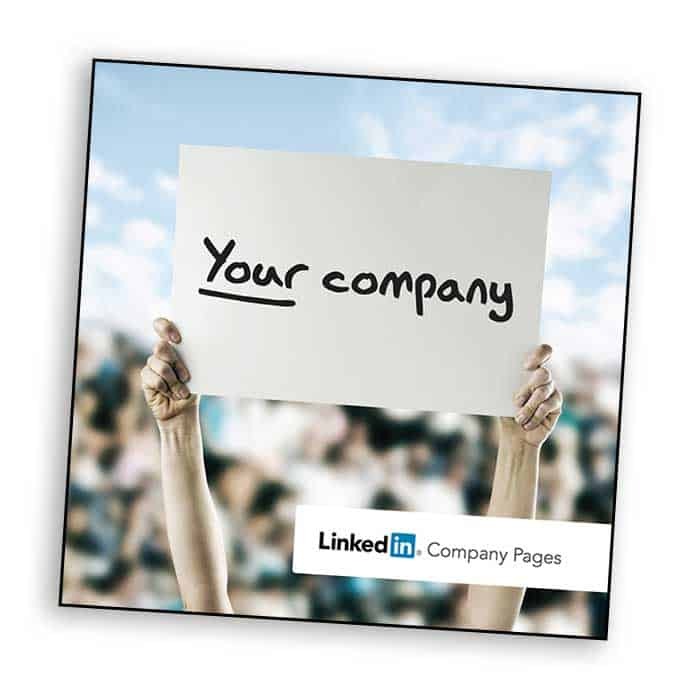 Download LinkedIn owns Company page guide. On the other hand, creating a LinkedIn Company Page shares public information about your Company via LinkedIn and is searchable via Google (and other search engines). You can also showcase individual products, rather than a generic whole. And you can post URLs to your sales pages without worrying about whether or not you are violating some guideline. Go to the Help Section to create a Company page. 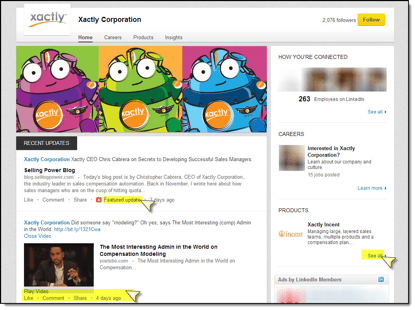 Notice the use of Featured Updates to create engagement, curiosity and activity, as well as rich media (the video). You can also browse through their products and check out careers. And on any of these pages, you can insert your customized links. And you can even add a banner to your Company page…. Use a professionally-produced image. Your message is important! You can upload a maximum of three banner images to your “Products and Services” section. 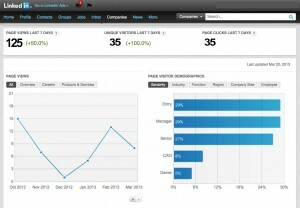 Once you’ve created your Company page, you can then add an advertising campaign. This strategy isn’t for everyone. It can quickly become expensive, and should be used only if you’re looking to make big-ticket prices on product, membership or package conversions. Consider also your demographic. If your market is predominantly female, you should remember that LinkedIn statistics still show its users as predominantly male. The younger demographic (25-34) is making a notice rise above the median, as is the 45-54 range, while the original LinkedIn typical age group of 35-44 has fallen slightly (though it is still over-represented). You can study general graphs and audience details at stats sites Alexa and Quantcast: Just enter LinkedIn’s URL into each site’s search bar and click through on results for even more details.